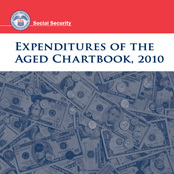 Expenditures of the Aged Chartbook examines the spending patterns of the population aged 55 or older, focusing mainly on the expenditures of those aged 65 or older. Policymakers and researchers are concerned about the adequacy of economic resources of the elderly. Income tells part of the story with regard to adequacy, but it is also useful to seek out other measures of standards of living, such as expenditures. The goal of this chartbook is to improve the availability of statistics on expenditures. This chartbook is based on data from the 2010 Consumer Expenditure Survey Public-Use File, sponsored by the Bureau of Labor Statistics. It contains many comparisons of the expenditures of the aged population (65 or older) with those of the near aged (55–64). Many charts include additional detail for those aged 65–74 and those aged 75 or older. Some charts in this book use box plots to show distributions of expenditures by presenting the 25th, 50th, and 75th percentile values for expenditure amounts or the percentages of total expenditures allocated to various components. The box plots are described in the About This Chartbook section. Patrick Purcell prepared this chartbook with the assistance of Kimberly Burham, formerly of the Office of Research, Evaluation, and Statistics. Staff of the Division of Information Resources edited the book and prepared the print and web versions for publication. Questions about the charts should be directed to Patrick Purcell at 202-358-6348 or patrick.purcell@ssa.gov.